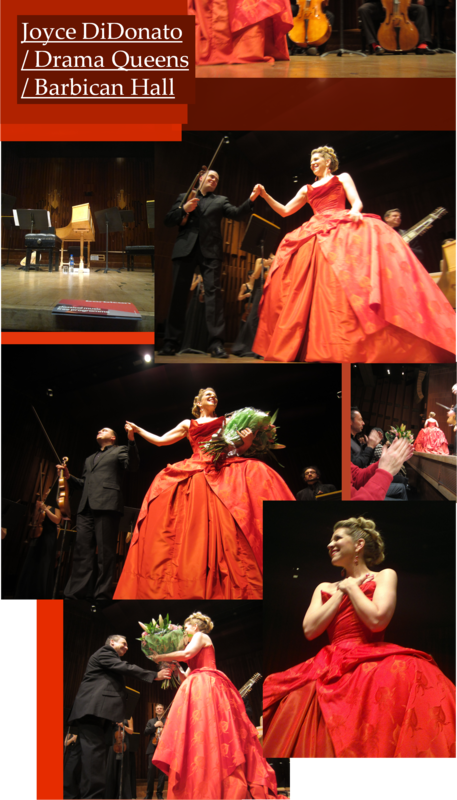 This was my second long weekend away to attend some performances by Opera North. This time the overall quality and breadth of repertoire was a mix of the accomplished, the dull and the dubious. My personal highlight was Lesley Garrett’s return to the operatic stage after over a decade in Poulenc’s take on Jean Cocteau’s one woman drama. She apparently proposed the project to Opera North and in many ways the subject matter of the piece seems to resonate with Garrett’s career and life trajectory, she is like Elle a performer past her prime and at 57 not an artist most critics would take seriously. Especially after having spent the last fifteen years singing amplified musicals and appearing in TV reality shows. She committed the cardinal sin in opera circles, she dared to be a popular entertainer when her ENO soubrette parts starting to dry out. Many called her career moves desperate and blamed her for disgracing her operatic training and the genre. Even very recently she sang a dreadfully mannered God Save the Queen for the award ceremony of the Tour de France to Bradley Wiggins. But have to give her full credit for the performance and for the choice of work. Voix is an unflinching monologue and in Aletta Collins’ direction she appears facing the audience for the first ten minutes through what appears to be a dressing room mirror, lined with lit up bulbs. Her anguished expression the only introduction to the piece till the chilling opening chords, quickly followed by the humorous xylophone produced telephone ring tone. When the stage front disappeared we were left with a mirror image of her dressing room with the mirror and objects behind her. From my box I could constantly see the reflection of the conductor in the mirror, adding an extra dimension to the piece…at least till her lover appeared at the back of the two-way mirror a few minutes later. The faded dressing room had a folding bed on the left and a shower cubicle on the right. Garrett moved between the two during the phone conversation with her unfaithful lover in a state of rising hysteria. The emotional development through the 45 minutes of its duration was masterful and with crystal clear diction she sold every word. She avoided the usual pitfall of over-sentimentalising or over-dramatising the finale. Her sense of anguish and imminent loss were communicated with subtle hushed lines addressed to herself while the receiver lied on the bed or her chest. Collins’ direction had her most of the duration of the piece in a black negligee with a plunging neckline giving Garrett literally no place to hide. Her voice and projection were more than adequate for the part which has few sustained sections but no one can accuse of lacking stage presence. She owned the part of the terrified scorned lover with such authority that it was deeply impressive. The performance by the orchestra under Wyn Davies was exemplary, bringing the mid-century sound of the piece alive and with an unmistakable Gallic tartness. Many feminist writers find La Voix indefensible and a sure sign of commodification of female grief, presented as an entertainment vehicle put together by two gay men. But having Aletta Collins and Garrett work on it, they added their own distinctive take on the work. It did not make us all feel voyeuristic in the slightest, it was more a confession by a dear friend of their innermost feelings. We watched on as she fell apart and contemplated suicide. The great concluding touch was to have a double for the dishevelled Garrett in front of the mirror (and her back to the audience) while she showed up behind the mirror wearing the red sequined dress that was still hanging from one of the dressing room lights. The work is also an interesting comment on the nature of performance and the attitude of an ageing performer to the knocks along the way. That very allusion to her own career path and its twists and turns made for a fascinating reading of the piece. Cocteau’s play is all about imperfect technology (the still unreliable telephone service heavily reliant on operators and compromised by crossed lines) and how it mirrors the imperfection of human relationships. Like a cruel phone calls stops Elle on her tracks, so we were left to mull over Garrett’s life and career in the public eye. 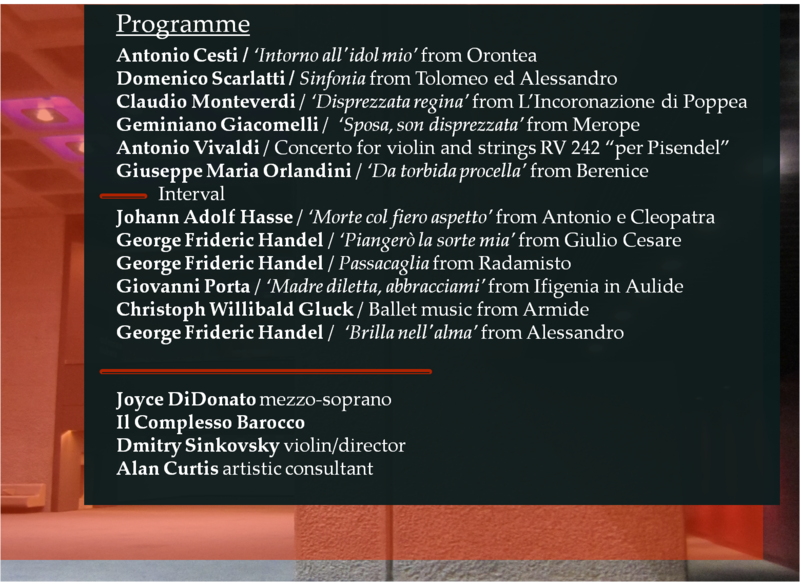 Unfortunately the productions of Otello and Dido and Aeneas did not grip me in the same way. Otello being transferred by Tim Albery to an american military base did not really offer much. Despite the beautifully functional set and costumes by Leslie Travers the staging did not really speak to me. The terribly old fashioned and heavily upholstered take by Moshinsky at Covent Garden packs, to my great surprise, more of an emotional punch. The orchestra sounded much rougher with Verdi’s frequent use of grand gestures punctuated by brass. The rather open orchestra pit of the Grand Theatre possibly amplified the musical issues, making me wish for more fire and direction. But the excellence of the cast cannot be under estimated, Ronald Samm was uneven (it seems he was suffering with a persistent cold) but sang with great affinity with the material and especially in his duets with Desdemona he was rather affecting, just a shame that their seminal duet in Act Two took place between two reversed pieces of set that had all the refined look of a public toilet, killing the dramatic impact of their confrontation. David Kempster’s Iago was a rather cunning, calculating human being. His Era la notte, Cassio dormia was beautifully coloured with a sense of underlying malice. He was the one singer that was vocally constant and brought depth to the production. The Desdemona of Elena Kelessidi was on the lighter side but brought beautifully spun phrases and was very focused in Act Four. I just did not believe much of the characterisation and that would be the fault of the director not finding a true personality for his main female protagonist. Usually like a much more dramatic soprano singing the part but Kelessidi delivered some gorgeous singing making the best of her resources. The extended chorus was near deafening in the opening scene and continued with much punch and bounce. Dido and Aeneas was an over produced and under thought mess. When one is reduced to counting how many Didos are on stage (final count was 9)…you know you have a problem. My main issue for being rather bored with this bedroom set performance was how short it was on magic. The dancing itself was very beautiful and nuanced but once all the secondary characters (the witches, the spirit etc) started arriving as doppelgänger of Dido my heart started to sink. I am sorry to report that despite some excellent singing (with just enough vibrato to annoy the period performance sticklers) from Pamela Helen Stephen who gave a rather heart wrenching finale the evening failed to be truly engaging. 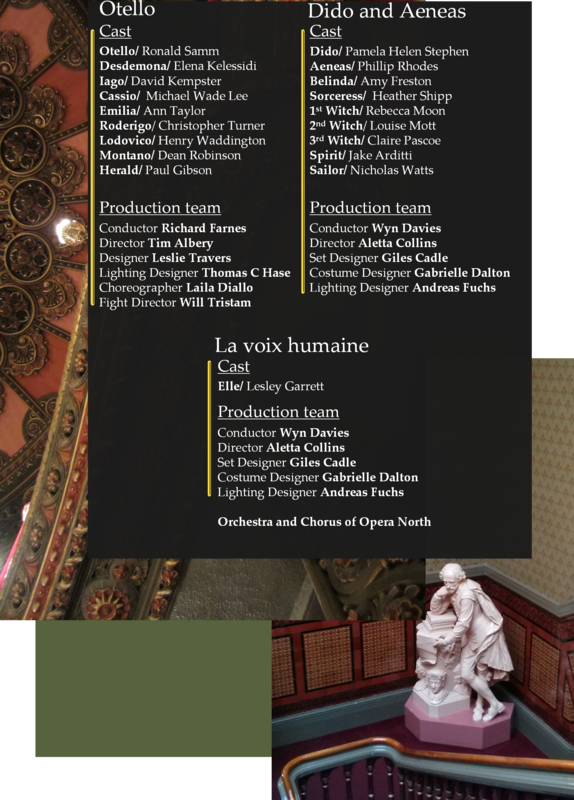 Notable also were Phillip Rhodes and Jake Arditti who made their Opera North debut in sparkling fashion. The beautifully bright timbre of Nicholas Watts was a glimmer of light in an already sunk production. Try to catch them while they are touring, forget what you’ve read in the papers about Garrett and book to see Voix it really is very, very good! 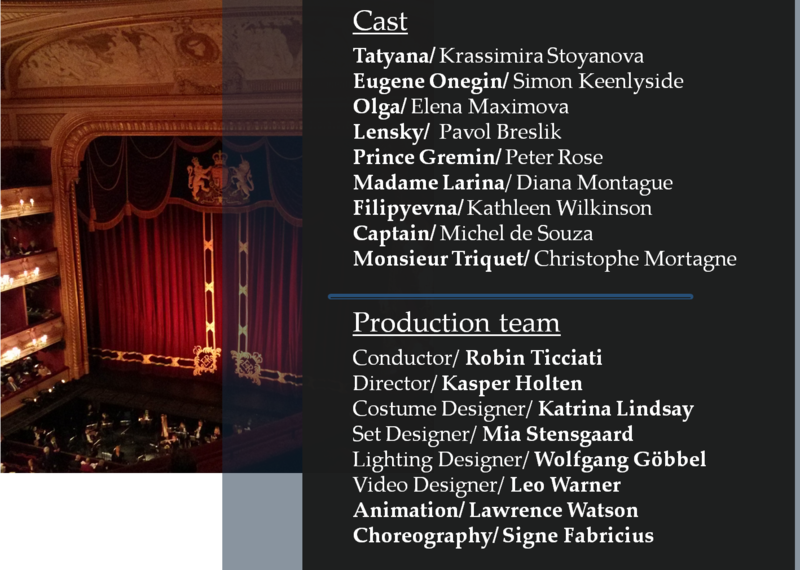 It was a catalogue of misfortunes that added to an overall uneven and at times unjustifiably flat performance of Yevgeny Onegin (the Royal Opera not too keen to use that title it seems). 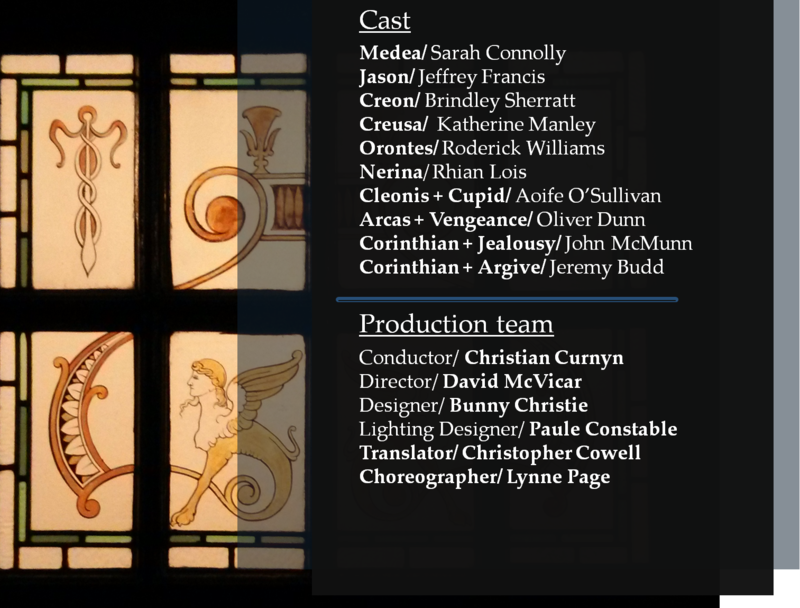 The non operational surtitles during the first half was not the best advert for the ROH but surely they have well practised tannoy apologies and they delivered it twice to the amusement of everyone occupying the cheap seats. Glad to report a pensioner’s riot and occupation of the Amphitheatre was averted at the last minute and a few photocopies of the synopsis later. Let me start from the positives, the set and costumes were rather elegant. The set comprises a four doored frontage is turn of the century plasterwork and mouldings. All in an off white colour heavily influenced by Vilhelm Hammershøi‘s melancholic interiors and the backdrops behind were modelled on Gerhard Richter‘s painfully beautiful and trendy abstracted photorealism rendered in video animation. Visually it was a potent mix that had an equal amount of suggestion and representation. 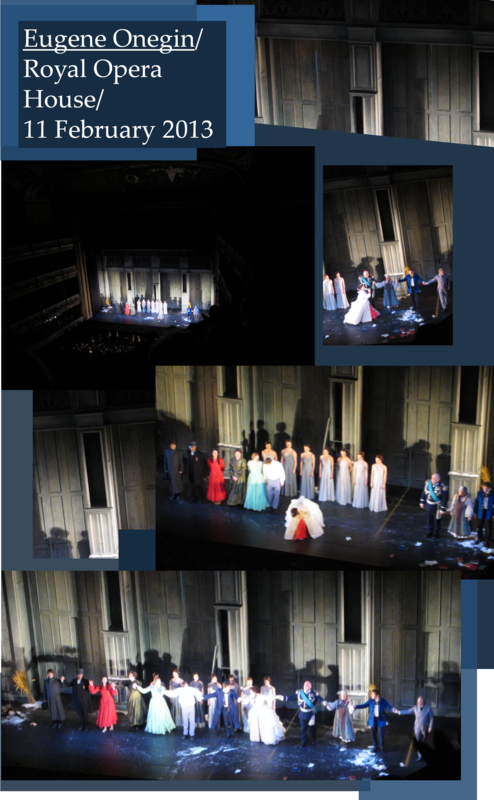 The respectively red and blue palette used for Tatyana and Yevgeny creating a stark contrast against the rest of the colour choices (pistachio for Olga, beige and powder blue for Lensky, black for the chorus) and making them pop. The set was particularly successful as a setting when the doors closed and the front of the stage became surprisingly intimate. 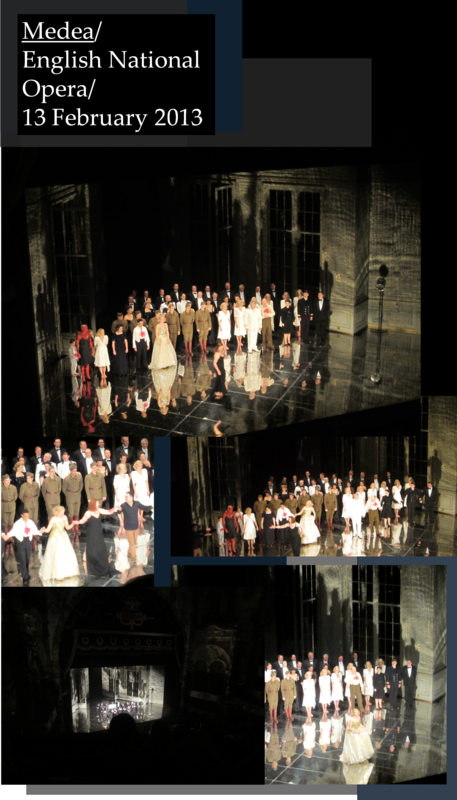 But somehow the parallel nature of the set made it look like something designed for Holten’s previous employer, the Royal Danish Opera, where they do scene changes by moving sets sideways. Spent most of the evening expecting the set to slide sideways, but to no avail since the ROH does not have such a facility the set stayed put. With Madame Larina’s ballroom looking as wide as a goods lift it barely inspired. Things did get better in the last act when Prince Gremin’s ballroom extended to a further room doubling the space and the perspectival play was very effective coupled with some well done choreography. Unfortunately the orchestra under Robin Ticciati did not seem to find its way through the lyrical score, with notable lack of balance at times and off pacing. Particularly the letter scene and the finale stood out too much with the orchestra playing too loudly and in total contrast to the earlier slack tempi that sent many a pensioner to sleep. The insurmountable obstacle that stops me from loving this interpretation is Holten’s use of doppelgänger dancers of their young selves idea for Tatyana and Yevgeny, it is both inconsistent (they only appear in a handful of scenes) and it is distracting that the singers acknowledge their presence. Had they been treated as memories and thus remained untouchable it may have worked. In this case it seemed like the director lost confidence in the singers to express emotion through their acting and needed the use of two dancers to mime instead. Another thought that passed my mind was the possibility that the Director walked into the rehearsal room and thought ‘oh my, they both look too old for the characters’ and brought in the dancers to embody them in Act One. The doppelgänger idea falls totally flat in the letter scene where Stoyanova is left just pacing on the stage while the “young Tatyana” rithed and contorted her way, draped herself on the chair and just sucked out the oxygen from such an accomplished singer, especially when she sang with such assurance and feeling. Another terrible example was the duel between Lensky and Yevgeny, with the dancer getting possession of the gun while Keenlyside looks on and mirrors his movements pointlessly. The apogee of this emptiness in the staging comes when the dancer actually pulls the trigger. It saps all the energy from this macho confrontation scene and renders it weak and almost incidental. You can imagine what must be going through Keenlyside’s head when he is being marginalised to such a degree during such a crucial scene. He did do his best but unfortunately I paid more attention to the branch that Breslik carried in for the duel, than the singers. Overall the singing was from very good to excellent, Keenlyside admittedly took a while to warm up but he was absolutely wonderful in the last Act. 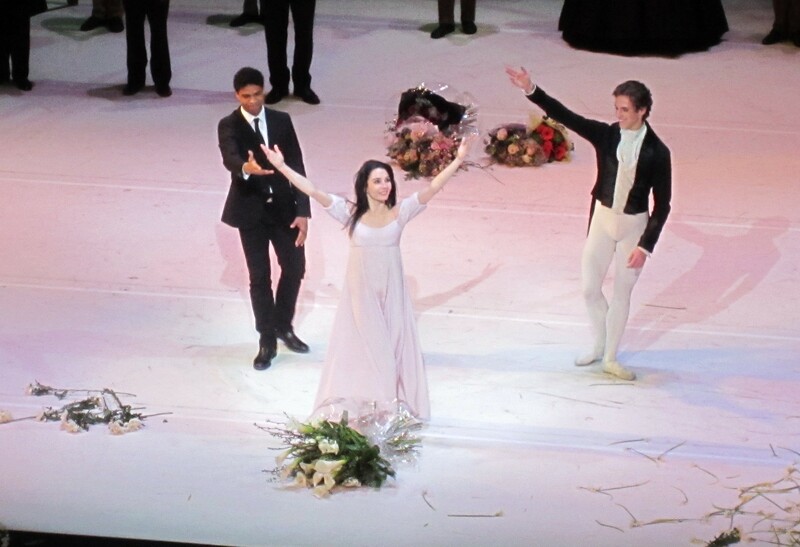 Stoyanova was wonderfully warm and paid unique attention to the libretto, also moved with elegance and when left to act (like in the last scene, where the doppelgänger has gone) she was captivating to watch. Peter Rose’s Gremin was as imperious as one would expect but also brought a vulnerability that made him much more believable than usual. Diana Montague, always a classy singer, delivered stage charisma in spades in the largely thankless role of Madame Larina. The audience’s favourite was Pavol Breslik who did sing with vim and longing and we all felt sorry for having to endure being dead on the ground for the last forty or so minutes. A ludicrous directorial decision that again added very little to the story and just made it much more difficult for him and his colleagues, who had to avoid stepping on him on a number of occasions. To be honest none of the clutter that made the front of the stage, from Tatyana’s strewn books to the harvested bunches of wheat, to the dead body ever got cleared. It was another comment on memory, but my goodness it made for sloppy looking staging and was rather too obvious. It is beyond me why directors find Onegin such a fertile ground for silly experiments. Tchaikovsky’s opera couldn’t be more straightforward and the fact he entrusted its première to the students of the Conservatoire in Moscow makes that evident. I presume Holten thinks he has added another layer of interpretation, with his direction focusing on the nature of memory and looking back in retrospect with regret. Unfortunately in this case all he added was a distancing device that told us surprisingly little that is not already in the score. Seeing it two days after Konwitschny’s Traviata and after the very successful Opera Holland Park production last summer it proved to be an evening of style over substance. This production did not seem to be happy to either go avant garde and offer a different concept or to be traditional. It occupied a middle ground that was neither very interesting or to the benefit of the material. This production of Traviata is definitely a rather unique proposition. The set is reduced to the absolutely minimum, the three acts get compressed into one long stretch with cuts. On paper it seems like a hard sell but after seeing it, I am happy to report that Konwitschny’s take opens up some new avenues for interpretation (not all of them happily realised) and tightens the drama. The set is a series of red velvet curtains further accentuated by bright red lighting. They become less opaque the further upstage one looks. With opening and closing to reveal less and more depth they seem to become a symbol for society. A force that smothers the love of Alfredo and Violetta. The only piece of furniture present is one bentwood chair and as an alias of a seat a pile of oversized books for bookish Alfredo to rest and think of his beloved. The Violetta of Corinne Winters (making her European debut) was endowed with a dark hued voice that was instantly charming and direct. She sang with great passion and dedication, hitting notes head on and being very physical. The fall off the chair while singing Sempre libera is a bit of an unconvincing oddity, accompanied by Alfredo singing from the front row of the Stalls. But overall the emotional journey was unwavering and not having the benefit of an interval and being almost constantly on stage, a tour de force. An interesting addition was that she wore a different wig for every Act but as a final gesture she took it off and died with her much longer hair actually on view. A moving gesture as a reference to the workings of theatrical artifice and a final dose of realism. The Alfredo of Ben Johnson was enveloped in gold vowels but unfortunately also the most hideous stage wardrobe ever imagined. Somehow I will never agree with the director that Alfredo is just a bookish outsider in a doomed relationship from the very start. This costuming and his sheepish attitude detracted from a more balanced conjunction between score and stage action. But his singing was beyond reproach and full of ardour. Germont pere was performed with disarming darkness by Anthony Michaels-Moore and even managed to make a phantom daughter (Konwitschny’s addition) work in his confrontation scene with Violetta. Making the implied reason for asking Violetta to leave Alfredo (bringing disrepute to his family and thus making difficult for his daughter to marry) added a motive for the early surrender by our leading lady. I can imagine some people would find it unnecessary but with the way Michaels-Moore interacts with her it did work and took the heat off the sometimes too brutal interaction between him and Violetta. The chorus wearing evening dress are a wonderfully overwhelming presence and even their exist after the curtain comes down (here literally the sets of curtains used to delineate space fall down) they are left to rhythmically scale across the stage as the foreboding overture for Act Three begins. A few people found it amateurish and not well thought out. but it does work signifying the fall of the predators in Violetta’s life and especially with the Giorgio left in the distance to survey the ruins of his son’s life. 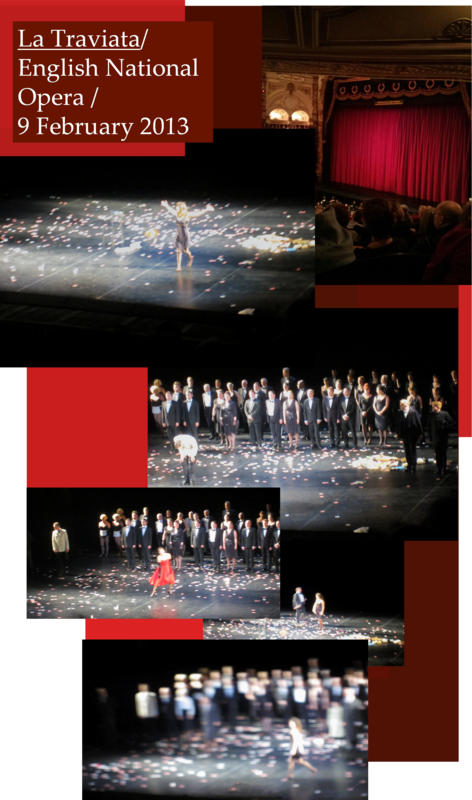 The orchestra’s playing was exceptionally dramatic in the hands of Michael Hofstetter who added even more energy from the pit serving admirably well the production. The final scene where Violetta fades away is very intelligent in its simplicity. She is left alone on the empty stage to live her last moments. She is happily back together with Alfredo but her illness separates them. In a coup de théâtre Annina, Doctor Grenvil (a great in-joke to have him appear for the last visit to Violetta still covered in streamers and a shiny party hat, after all he has always been a joke of a doctor for the duration of the work) and Alfredo are by standers to her drama from the side of the audience. The orchestra pit becoming the chasm between life and death. Also instead of collapsing on a big plump bed, Winters walks to the blacked out back of stage after the remaining set of black curtains has parted. 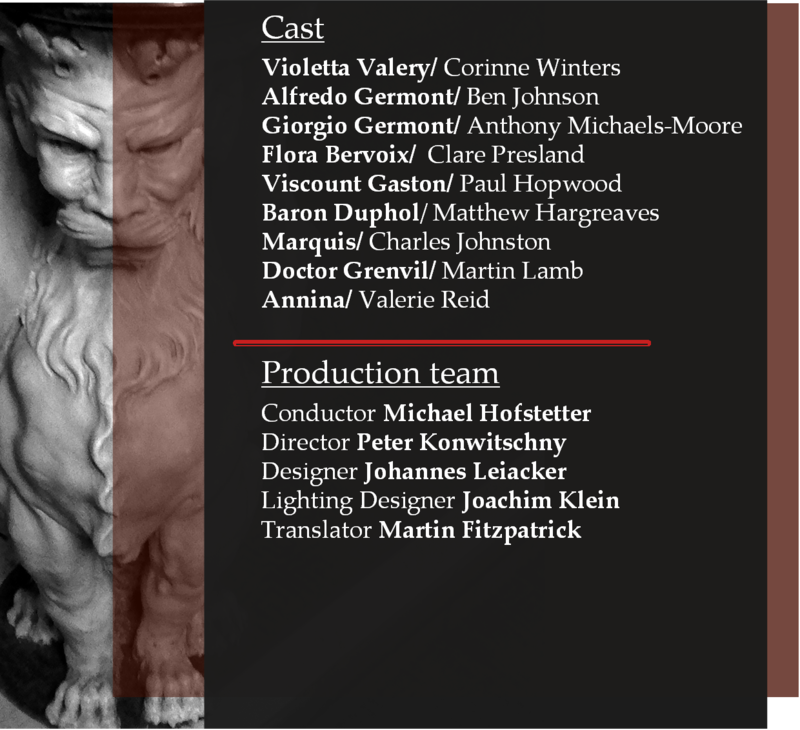 A simple but satisfying way to bring this austere production to a close. Konwitschny’s vision can only rise to a satisfying evening on the back of an exceptional cast as they are the unwavering focus of the direction. It seems that ENO managed to bring a trio of singers that work beautifully together and bring heart to this domestic melodrama. By not having an interval between Acts One and Two it does compromise the flow by not allowing for proper distance but the tautness we gain adds such a punch. The direction like the opera itself is unashamedly emotional and the cuts to the score paired with the sparse set creates a sense of isolation from the wider world, a reflection on the bubble of true love or maybe terminal illness. One can get carried away looking for symbols and metaphors in every turn of this production, but that is the ultimate triumph of it, being a tabula rasa for the audience. Making the story of loving the wrong person and being punished for it even more contemporary we could ever think it is. Go and see it even if you never been to ENO, it will surely make you think and hopefully move you!